If you have a garden or a large terrace, you will surely want to take advantage of every corner. In the market, you will find many elements to take advantage of, and when you choose you should not forget to acquire some that help you have a protected area to have shade in the hours when the sun goes down. The wooden pergolas can be ideal for it and, in addition, they contribute that rusticity that we want so much. The pergolas are structures made with wood, although they can also be made with other materials such as aluminum, which have vertical columns and longitudinal beams that help us to delimit a space, either on the terrace or in the garden. Even these structures can be attached to the house to create a porch, although the most common is to see independent wooden pergolas. Where can I place the wooden pergola? If you liked the idea of having a wooden pergola in your garden or terrace, you should think about where should best to install it. Many people put it next to the pool, on the porch or in a passage area. There are also those who place it in a corner to make a dining room and enjoy with the family. As you can see, there are many possibilities, so it is important to think about the position of the sun with respect to the place you have available to know how to orient it and that it does not generate shade where you want the sun to be. That way, you can get the most out of it. Any boring garden can become the favorite space of your home simply by installing a wooden pergola. This structure provides a seductive half-shade that invites you to enjoy the time outdoors. Definitely, there is nothing more pleasant than a relaxed nap or a family lunch under the shade of a pergola. How to decorate the space that is below? There are many possibilities to decorate the space that is under the pergola, although, usually, they usually add outdoor sofas, as well as cushions, a small table in the center and hanging plants. If you have a large family, you can create a dining room. 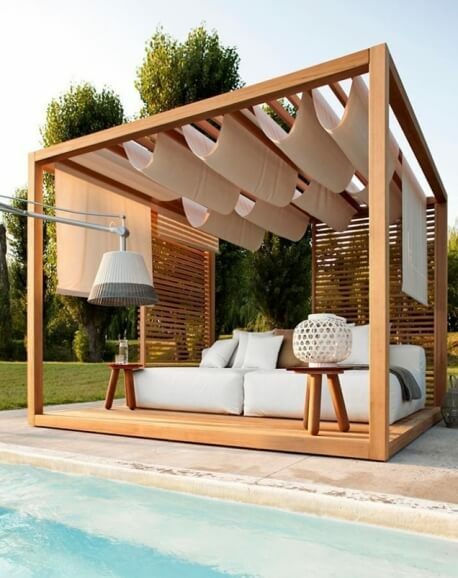 Choose wooden or wicker furniture that matches the color of the pergola and look for colorful elements, as this area is usually used mostly in summer. On the other hand, do not forget to install lights or garlands, in case you want to use the corner at night. Remember that this structure is usually in the face of inclement weather, therefore, the ideal is that you add an awning or a climbing plant that may come to cover it completely. However, with this last will take much longer to create protection. If you do not want to deal with their care, decide for a glass pergola.